About a year back I picked up a copy of The Lost Ways, by Claude Davis. I was intrigued by the idea behind it, and the book itself lived up to my expectations. In fact it was fascinating. 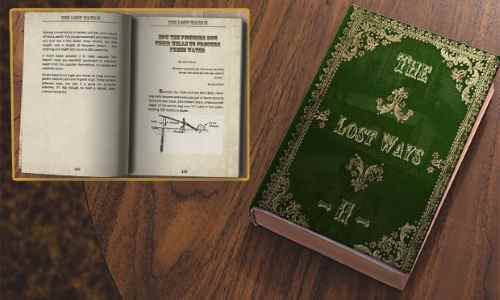 So I was delighted to see a second volume, The Lost Ways II, and I bought a copy right away. If anything I was even more impressed by this one. Its 400 pages packed in an incredible amount of knowledge that was commonplace a few generations ago, but has now been forgotten by almost everyone. It certainly hasn’t been forgotten by Claude. In fact he’s one of those rare people who doesn’t just know a lot; he lives it. Claude grows and preserves most of his own food. He makes most of his own clothes. He even built his own house. And he does it all using skills that would have been familiar to our great-grandparents. A few days ago work happened to take me not far from where Claude lives, and I decided to give him a call. I really just wanted to thank him in person for creating such a great resource for anyone who values preparedness – or even just has an interest in practical history. It soon turned into much more of a conversation than I’d expected, though. To my surprise, Claude had actually read some of my own work – and when he realized I was in the area, he invited me round. It was a nice day, so I parked a little way from Claude’s home and walked the last couple of hundred yards. As I did so, it seemed like I felt the 21st century slipping away – and that feeling was complete when I reached my destination. Claude lives with his wife and kids in a log cabin he built himself. It’s a scene right out of the pioneer days, down to the cauldron hanging over a cooking fire out front. He keeps livestock, and has a big root cellar full of food he canned and preserved himself. He even makes most of his own clothes. I thought at first that Claude had turned self-reliance into an art form, then I realized I was wrong. This is his way of life. After introducing me to his family, Claude and I sat down and chatted about his books, and what inspired him to write them. With his permission, I’m going to share part of that conversation with you. Me: I was impressed at all the knowledge you’ve collected in your books – and, after the first one, I would never have guessed there was so much useful stuff to write another, even better, book. Still, reading it isn’t the same as seeing you here actually living it. You really do take preserving the lost ways seriously, don’t you? Claude: Yes, I do. I think keeping the knowledge that helped our ancestors build this country is one of the most important things we can do. In fact I think we have a responsibility to do just that. Not so long ago, every generation passed on all they knew to their children. How to do things, how to make things, how to get by when life was tough for a while. So we had this store of knowledge, and everyone did their part to preserve it and add to it. Then, two or three generations ago, that all changed. Suddenly it was easier to let modern technology do all the work. The old ways were too much work, or not exciting enough. Instead, people decided they always had to have the newest technology. But they depend on businesses to give them that – and the next thing, and the next. Along the way, they forgot how to do things for themselves. Me: I get the feeling that’s not what happened in your family. Claude: And you’re right. I was raised by my grandparents, and even back then I guess you’d call them old-fashioned people. They grew up knowing what poverty was – real poverty, not “Oh no, if I buy the latest TV I’ll have to skip a vacation” – and they never forgot what it was like. They learned valuable lessons, and they made sure I learned them too. I can never thank them enough for that. Me: What do you think their most important lesson was? Claude: To make the most of what you have, instead of wishing for what you can’t have. I don’t think I ever saw my grandparents waste anything. You know what people today are like with food, for example. Leftovers, or anything that’s two days past its use-by date, or even stale bread – it goes straight in the trash can. Not my grandmother. Leftovers could go in a stew or soup. That stale bread would make crumbs or pudding. And even if something was out of date, she’d only throw it out if it really was too far gone to eat. Usually, she could do something with it. And my grandfather, whenever something broke or wore out, he’d try to fix it up. If he couldn’t do that, and he usually could, he’d break it down and keep the parts that might be useful someday. They never threw anything away just because it was old. Me: I remember reading something you said about that – older generations were doers, not consumers. Claude: Well, that’s what I believe. If they had a problem they stepped right up and looked for a solution. They didn’t complain, or expect the government to fix it for them. They could look after themselves, and they took pride in that. Rightful, earned pride. People now, they’re proud of the new TV they bought on credit that they can’t really afford. But what’s that compared to the pride you can have in building something yourself, repairing something yourself, doing something yourself? Me: I totally agree. I always prefer to do things for myself. Claude: Sure! That’s why you like my books. I’d guess that’s why you called to thank me for writing them, right? Me: That’s exactly it. You’ve inspired me to look at different ways of doing things. I thought I was pretty self-reliant, but what’s in your books is a whole new level. Claude: That’s just what I like to hear. There’s a whole lot more to living a good life than having the latest gadget. A lot of the time, the old ways are better. If we lose power and the internet, the old ways are going to win every time. And that’s what I want people to learn from my books. There’s one question I have for you. What was your favorite chapter in The Lost Ways II? Me: That’s a hard one, because there’s so much in there. All the uses for charcoal, edible plants I’d never heard of, that I now eat every week. But if I had to choose, it’s the chapter on building a log cabin. It’s so simple, but you’ll get a home that will last a lifetime. That’s a skill that’s going to really make a difference if you have to start again after a collapse. Most people would struggle to put up a half-decent lean-to, but with the techniques our ancestors used you can build a proper, weatherproof house. When I said that, Claude just glanced at his own home and smiled. That pretty much said it all. The knowledge collected in The Lost Ways II is real, practical stuff, and Claude himself is living proof of that. We talked about a lot of things – too much for me to write about here. For me, the main thing was that I got to meet a man who’s inspired me to learn so much more about self-reliance and preparedness. There aren’t many people like Claude around anymore, and now I realize what a sad and dangerous fact that is. It’s time we appreciated the store of knowledge our ancestors left for us, and that’s been lost to so many of us. Previous PostWould Rural Areas Be Safer In A SHTF Situation? I have get some of interview knowledge about the company and impressed the interviewer.